If you’re not an early bird and didn’t wake up at 5 am to watch the royal wedding, well then hopefully you have it recorded because it was an event you did not want to miss. Millions tuned in to watch the union of Meghan Markle and Prince Harry and while all eyes were on Meghan’s wedding gown, it was the guest’s attire that caught our attention. Those who were lucky enough to make it on the list could all be seen sporting one thing in common: fascinators. Another name for a headpiece, fascinators are a staple in the royal family, especially for Duchess of Cambridge Kate Middleton. Everyone from Oprah to Amal Clooney was seen sporting one to the wedding and we must say, some looks were pretty outrageous. These were the best and craziest fascinators of the royal wedding, which one do you love? 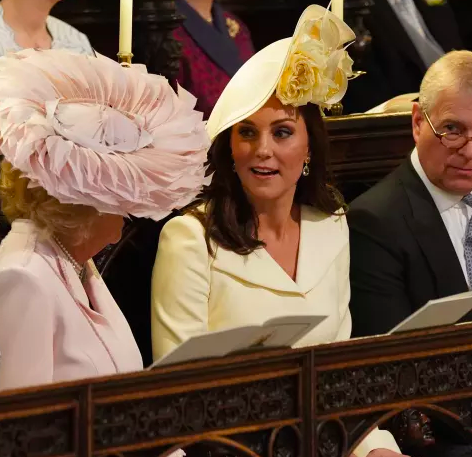 Meghan’s new sister-in-law, Kate Middleton, wore a pale yellow floral hat by Philip Treacy and looked as stunning as ever, especially for just giving birth one month ago. Oprah went bold in a wide-brimmed off-white hat with flowers and feathers. Amal Clooney looked elegant in a canary yellow dress and matching yellow fascinator with a netted overlay. Meghan’s mother, Doria Ragland, kept it simple and sophisticated in a light green Oscar de la Renta hat. Pippa Middleton matched her light pink fascinator perfectly to the floral details of her beautiful printed green dress. Priyanka Chopra was also color coordinated to the royal wedding in a swooping lavender hat with a lavender blazer and skirt. Attending her second royal wedding, Victoria Beckham stepped out with her husband David in a navy blue netted fascinator. Last but certainly not least, Queen Elizabeth wore a lime green hat adorned with purple flowers on the brim.